Acceleration of clotting and healing. Swamp Blood is a blood-congealing and circulation-slowing concoction that has numerous medical and practical applications. The potion is treasured in the medical world for its lifesaving capabilities as well as its reputation to aid in the recovery of internal bleeding and hemorrhages. Misuse of the potion can cause severe pain and atrophy of the body due to the imbalance of blood that it can cause. It has therefore been reserved as a last resort or emergency remedy for those who are suffering from mortal bleeding. Unlike many of the modern potions that were pioneered by Allar alchemy, Swamp Blood has been a traditional remedy invented by pre-Cataclysm Ailor. It is theorized that it was originally created during the Ceardian migration to the new Ceardian states, and had slowly distributed itself through trade following the Cataclysm. 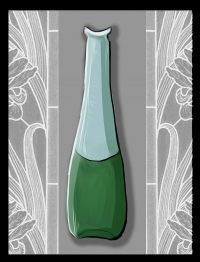 To any Ailor living beyond the realm of New Ceardia, the potion was considered a luxury of the Silver Shores kingdom during their golden age of commerce. The recipe has been unchanged for hundreds of years. The process of brewing Swamp Blood is somewhat dangerous, as it uses poisonous herbs to achieve the blood thickening effect that the potion was made for. A single mismeasurement of ingredients can turn the resulting concoction into a stomach-upsetting, otherwise useless drink of no value. To start, the cow tallow must be melted in a copper-coated pan and mixed with the hemlock and Nightshade petals, which are ideally ground down into a fine powder to allow for precise measurement. Honey must be poured over the mixture slowly as it boils away, leaving the tallow to reform with the herbs. Before it hardens, the mixture must be placed into a container made of clay and treated with a splash of strong alcohol, preferably the alchemically significant Vocadine. The concoction is finished with the steeping of the petals of a Ruby Flower to counteract it's poisonous qualities, and allowed to rest upon a low heat for at least thirty minutes before being completed. There are two ways to apply Swamp Blood. The primary method is to have the patient ingest the concoction, and let the effects come once the liquid reaches the blood system. Although quick, this is also the most dangerous method as it can easily be over administered through consumption. The safer and slower way, used often in battle when the patient is not far from where they were wounded, is to apply the Swamp Blood as a poultice and bind the wounds before the open gash starts to clot. Swamp Blood is treasured for its three functions, all of which relate to halting the movement of blood in the body. Firstly, the combination of toxins in the concoction causes the blood to thicken, making it easy to congeal and clot while it is still within or on the body. The heart also starts to slow down its functions, further limiting the movement of blood through the body. As a result of the combined effects, the bleeding of deep wounds can be stopped and set on the path of recovery. Provided that the patient is at rest, the potion lasts for up to 8 hours. If there are no open wounds or sores on the body when Swamp Blood is ingested, the potion starts to take a sinister effect that instills great pain in the chest and head. In large amounts, the potion is debilitating and causes the body to lock up with the lack of blood circulation. This violent effect wears away after the same 8 hours, though it can be lessened to approximately 3 hours with the careful administration of pure water or Middencroft’s Decoction. Identifying Swamp Blood is best done by a combination of smell and sight. It is recognized for its faintly pungent herbal smell, along with its appearance of a thick green liquid. Upon ingestion, Swamp Blood has a bitter-sweet taste that leaves behind a nauseating aftertaste not unlike vomit. According to rumor, vampires who drink the blood of those affected by Swamp Blood will find themselves in great pain and moderate paralysis. For this reason, some vampire-hunting individuals will keep a vial of the potion in their belongings in case they do not have faith in their combat skills. Swamp Blood is sometimes used maliciously to debilitate the healthy and robust. Rogues are known to try and sneak the potion into the drink of unassuming guards who are too drunk to come to their senses. Many Altalar and Avanthar refuse to be treated with Swamp Blood, on the account that it is a medicinal embodiment of Ailor crudeness and brutality.